One of the things scientists do today that never happened in the past is to request official permission to conduct scientific research in another country. It might seem a bit bureaucratic and overly pernickety, but the issue of permits for collecting is an important way in which tropical countries rich in biodiversity manage their natural resources – probably the most important of which is biodiversity itself. In Peru, all permissions for collection are managed through the Ministry of Agriculture, and there are clearly laid out rules for how to apply. I already have a permit for collecting Solanaceae – but this year I needed to sort out a permit for new work to be done under the Museum’s science initiatives. Crop and Pest Wild Relatives (CPWR), managed by me – we jokingly call it the rocks, pox and crops initiative! Our main idea in the CPWR strand is to use the data from our and other collections to look at the distributions of crop wild relatives and the wild relatives of major crop pests, then use these data to model both plant and insect responses to the changing environment, taking into account the evolutionary relationships of each of the groups, a sort of orthogonal axis. We have chosen to begin with the rich Solanaceae dataset I and collaborators have amassed over many years of databasing specimens in herbaria all over the world and manage through Solanaceae Source – it means the plant layer is done already! We will then begin to digitise (image, database and geolocate) all the Museum’s specimens of three major pest groups – beetles (relatives of the Colorado Potato Beetle, one of the worst pests of potato), leafhoppers or jumping plant lice (devastating pests of all kinds of crops), and fruit flies (big pests of tomato and aubergine). We also will do a new kind of collecting, where entomologists and botanists go in the field together – we will collect all the insects associated with particular Solanaceae species (well, really from any we see), thus compiling data on who lives where and on whom. Hence the need to collect insects on Solanaceae in Peru – the centre of diversity for both wild potatoes and tomatoes. And the necessity of obtaining a legal permit to export the specimens so they can be compared with our collections and identified; I completed all the paperwork last night, and submitted it all at the Ministry today. The importance of doing this now is that we are taking advantage of my current collecting trip to Peru for Tiina and my joint project on endemics, and two Museum entomologists are joining us in the middle of May – Erica McAlister (curator of flies and well known from her flygirl blog!) and Diana Percy (researcher on leafhoppers) will test out our collecting protocols and get the first field data for the initiative. It is exciting, as it feels like things are really starting! Lima is a funny place – it is big, chaotic and has a very energetic, almost frenetic feel. It is in the dry coastal zone of Peru, so rain never (or very rarely) falls – the only moisture is fog from the sea. Getting to the Ministry involves wild taxi rides through crowded streets – dodging accidents and traffic jams. I lived in Peru in the 1980s, at a difficult time for the country; it was in the grip of the Sendero Luminoso (Shining Path) terrorist threat then. Today Lima is a more open, vibrant place – and things are really happening. 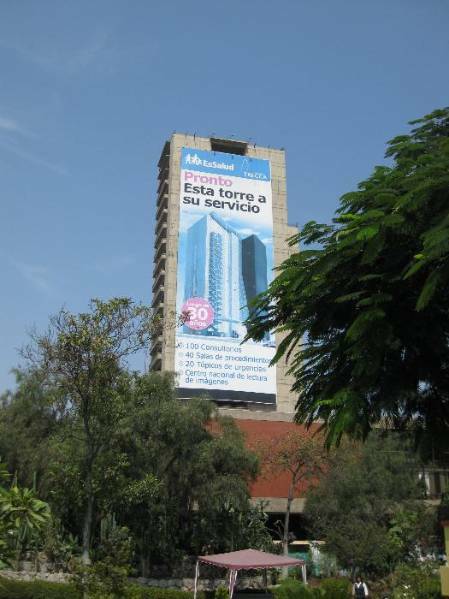 Even the huge multistory tower that is part of the Social Security complex next to the Peruvian National Natural History Museum looks like it is due for changes – the sign says 'Soon this tower will be at your service. After 30 years'. This building has stood empty since the early 1980s, towering over the museum gardens. So, let’s see if things really do change! The Seguro Social tower - ready for a long-delayed makeover! We head to the north on Sunday – passing through the herbaria of Trujillo and Cajamarca to enter data from specimens of endemic species into Solanaceae Source. Then the fieldwork blog will really be about field work at last! KCTomato on Where did the time go? Sandy Knapp on Back in Peru… and happy to be here! Terra on Back in Peru… and happy to be here! Permits and permissions - and finally I get to the field! How many species of Solanum in Peru? Back in Peru… and happy to be here!